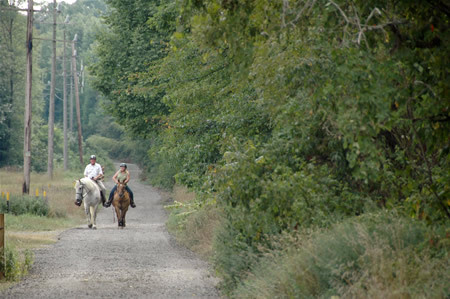 The Union Transportation Trail is the County's second rail-trail; ideal for equestrians, hikers, walkers, joggers and bicyclists. The first two miles of this gravel trail, opened in 2010, include a rehabilitated historic wood trestle bridge over Lahaway Creek, which is one of the few physical remnants of the old railroad. Two parking lots and access points are available at Millstream Road, Rt. 537 and Jonathan Holmes Road. Miles three and four of of this trail (from Jonathon Holmes Road to Davis Station Road) opened in 2011. This linear section of trail crosses Miry Run Creek, via earthen berm, and offers vistas of fields and rural scenery. The Park System continued to open sections of the trail as work was done until the last section of the trail was finished in January 2017. Now complete, the Union Transportation Trail runs nine miles. Upper Freehold Township recently completed a short connector trail from the parking lot at Town Hall (314 Route 539) to the Union Transportation Trail (UTT). This 560 ft. spur connects to the UTT just north of the Jonathan Holmes Road trail parking lot. The project was completed with the help of a NJ Trails Grant and provides another convenient trail access point for municipal employees and residents. The spur is 560 feet long. The Union Transportation Trail was once the Pemberton & Hightstown Railroad, a short line right-of-way established in 1864 to provide dairies and farms access to larger railroads at junctions in Pemberton (Burlington County) and Hightstown (Mercer County). The railroad began operating in 1868, traveling through Hornerstown, Cream Ridge, Davis, Imlaystown and Sharon in Upper Freehold Township. Passenger service ceased in 1931, but freight service continued on sections of the line until 1977. 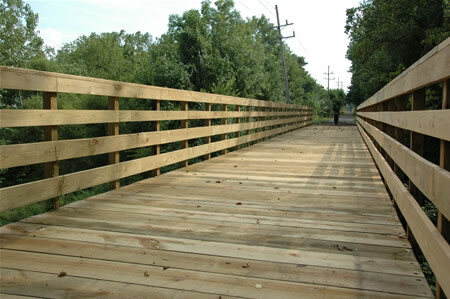 The right-of-way was acquired by Jersey Central Power & Light and in 1998, the Park System obtained a permanent easement from JCP&L for trail use. Click on her to open as a PDF. From Freehold or 195 exit 16, west on Route 537, cross Route 539 and continue approximately 1 mile to Millstream Road. Turn right, parking lot on left. From Ocean County, east on Route 537 and cross Rt. 68. Continue approximately 6 miles to Millstream Road. Turn left and parking lot on left. From Freehold or 195 exit 16, west on Route 537. Turn right at traffic light onto Emley's Hill Road then bear left onto Jonathan Holmes Road. Lot will be on right. From Ocean County, east on Route 537. Turn left onto Route 539 (Forked River Road) then right onto Jonathan Homes Road. Lot will be on left.